Is it appropriate to speak to television personalities when they’re buying underwear? How should you react when a transsexual wants to show you her latest surgery? What is the correct etiquette for visiting a brothel? 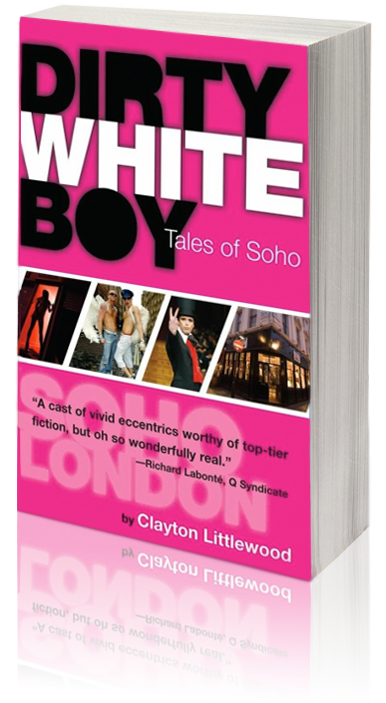 These are the questions that matter in London’s Soho neighbourhood, where Clayton Littlewood and his partner Jorge Betancourt run a designer clothing store Dirty White Boy. From his window on one of the busiest street corners in the world, Clayton watches the daily parade of fashion queens, prostitutes, gangsters and celebrities that make up the population of this strangest of villages. His Soho diary is a snapshot of modern London, caught between the ghosts of the past and the uncertainties of the future. The cast of characters range from Sue and Maggie, the girls from the brothel upstairs, to Angela the feisty trannie, to Pam the Fag Lady, begging for money and cuddles and Chico, the campest queen on Old Compton Street. Not to mention cameo appearances from stars (Kathy Griffin, Janice Dickinson and Graham Norton). And amidst all this madness occurs one of the strangest and most touching love stories you will ever read.